On Friday I had the opportunity to work with some of the staff at Stephen Central – my home school last year. I wanted to highlight some of my experiences today and share some of the amazing work happening at Stephen! 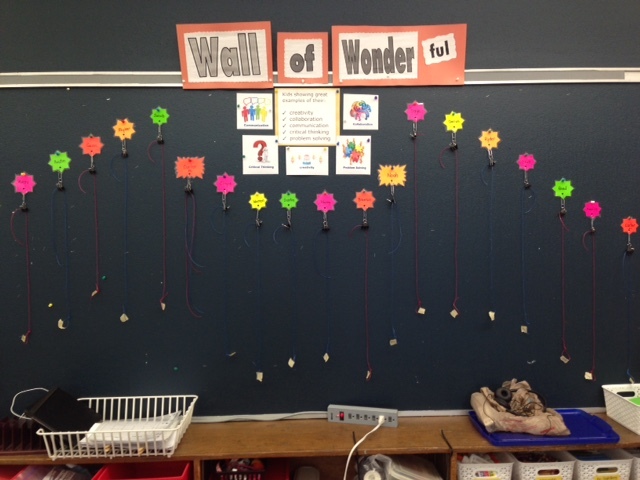 Heather has created a Wall of Wonder-ful in her classroom. Currently she is using her Wall of Wonder-ful to support her home reading program, however this will evolve as a space where students showcase learning that demonstrates one or more of the student outcomes. To support her home reading program, the bulletin board includes each student’s name, and under each name hangs a necklace string. Every time students read 10 books they get to add a bead to their necklace string. Once they have earned enough beads to complete their necklace, they get to take their necklace home and begin a new one. I am looking forward to seeing how this bulletin board evolves! Nicole and the Grade 2/ 3’s welcomed a new student to their class today during a video conference with her from her home. Sophie is currently being home schooled by AmberLee Overholt (a teacher in AMDSB) because she is not yet well enough to come to school. Nicole and the Grade 2/3’s will continue to video conference with her a few times each week until she can join them at Stephen. For their first video conference they spent some time getting to know each other. The kids took turns sharing information about themselves and asking each other questions. When I visited Skye’s Grade 6 classroom the kids were using their iPads and an app called Ping Pong to answer multiple choice questions about paragraphs. Skye would display the topic sentence and detail sentences on the SMARTBoard, and then read them aloud to students. The purpose of the activity was for students to determine which one of the four sentences did not describe the topic sentence.